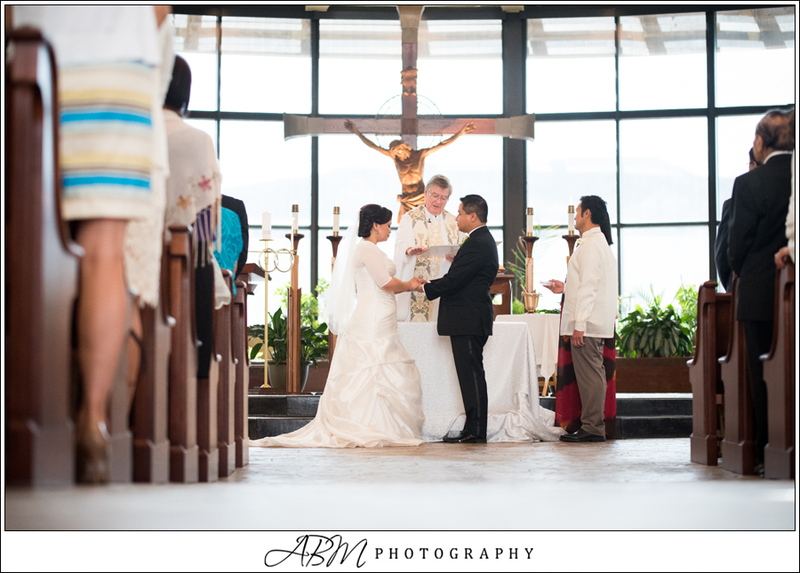 St. Therese of Carmel is a gorgeous Catholic church, so I am always giddy when couples choose me to help plan their weddings there. 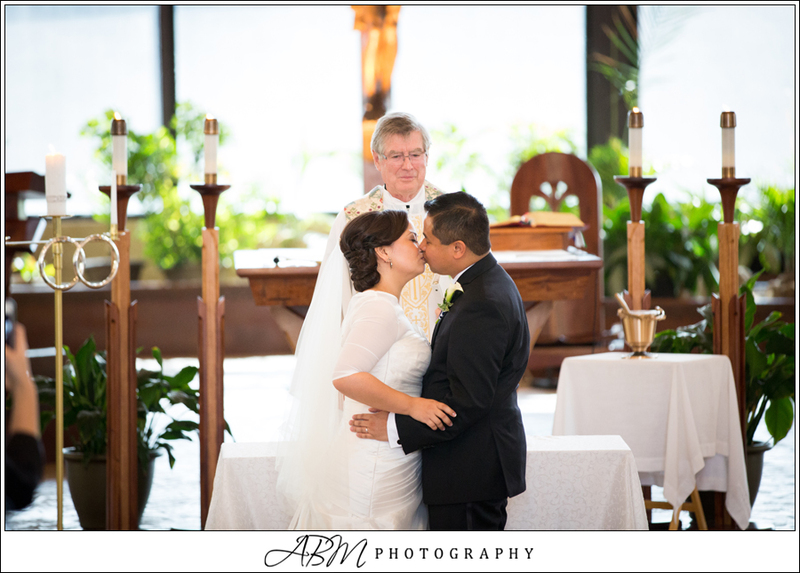 Ed and Melissa were visibly in love when I met them and I watched their love and devotion to each other grow throughout the wedding planning process. 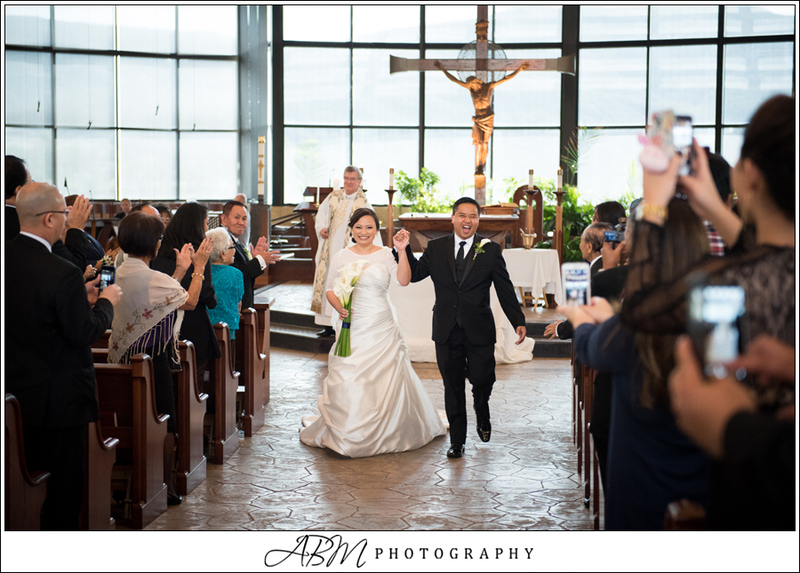 The traditional Catholic ceremony included several family members of the bride and groom and celebrated their strong tradition of Catholic faith. After the ceremony, guests traveled a few miles East to The Santaluz Club for a lunch reception in their white wedding tent. 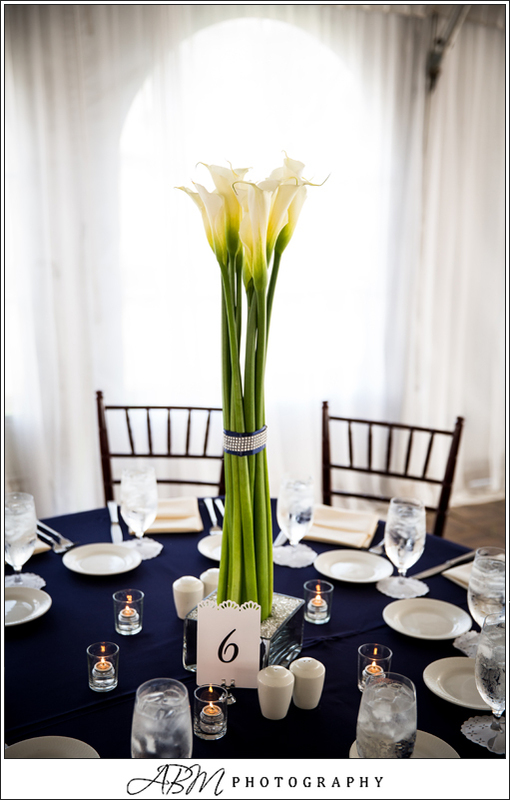 The couple wanted a simple, classic and elegant white wedding with calla lilies and navy blue accents. 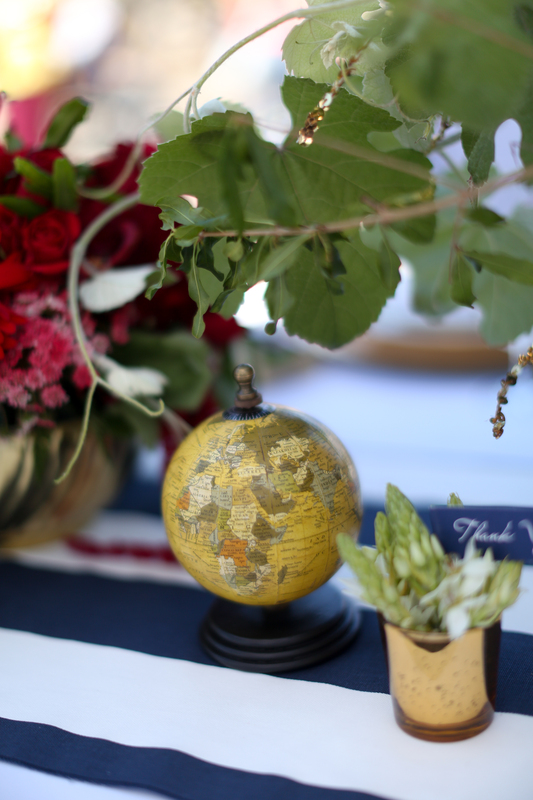 FloralWorks and Events provided the navy table linens and created the tall centerpieces featuring the gracefulness of the flowers. 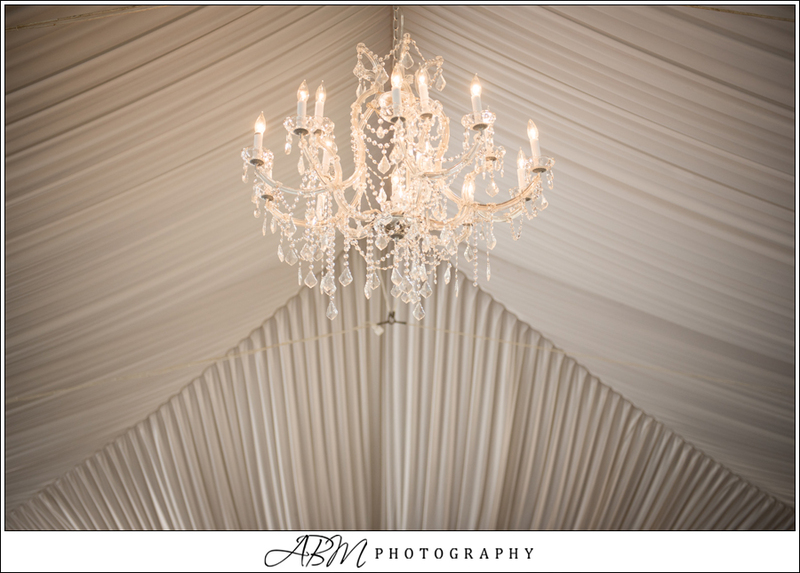 Chandeliers added a touch of elegance over the dance floor as guests danced to the music of Republic of Music. 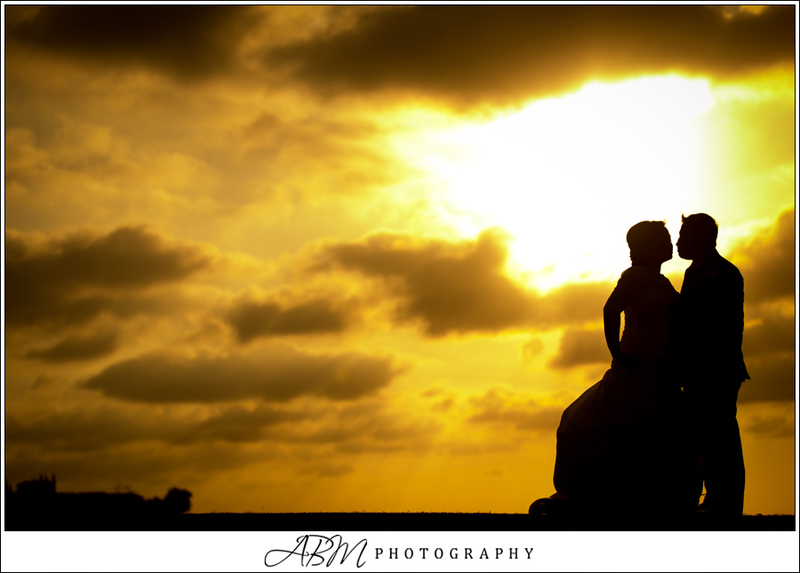 We were blessed with a dramatic sky – perfect for capturing photos of the newlyweds! 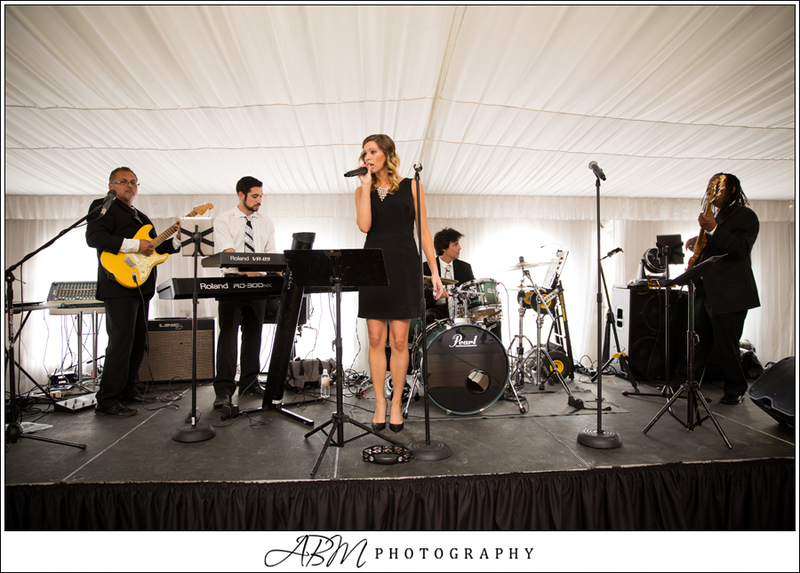 Thank you to ABM Photography for sharing these amazing photos! This military-inspired wedding photo shoot gets its style from the United States Marines dress blue uniform. It’s clean lines and patriotic colors let you know this couple is proud of their service while still expressing the bride’s personality with the fun feathers, gorgeous florals and dainty accents. The gold sequins and caramel macarons mimic the gold uniform buttons. And speaking of buttons, hundreds were donated by military families to use as decor for this very special table. 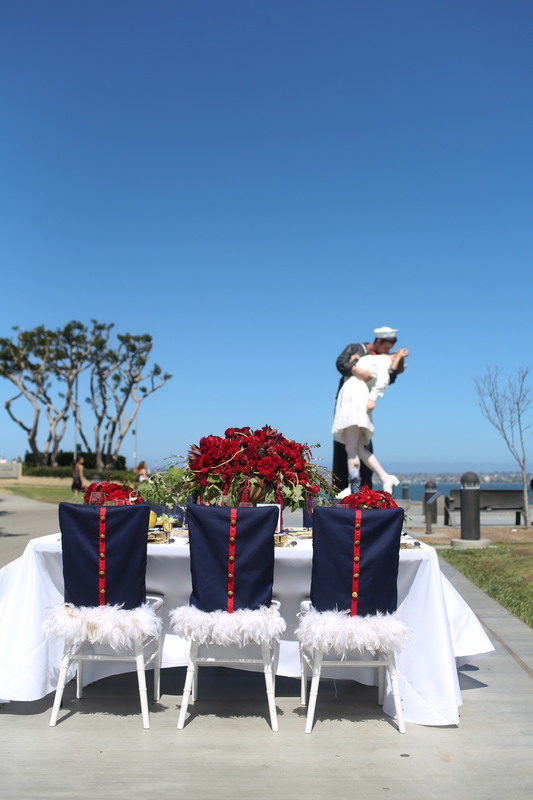 We shot this tablescape at the Unconditional Surrender statue at Tuna Harbor Park in San Diego. 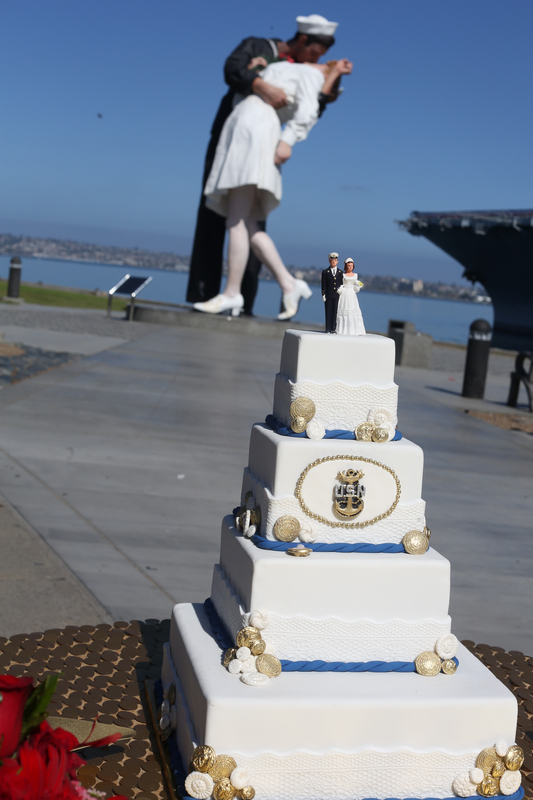 The cake, created by Cute Cakes, we just perfect for a military wedding! The buttons on the cake were all made of chocolate. The sword used to cut the cake as well as the bride and groom cake topper were used in my parents military wedding nearly 50 years ago. 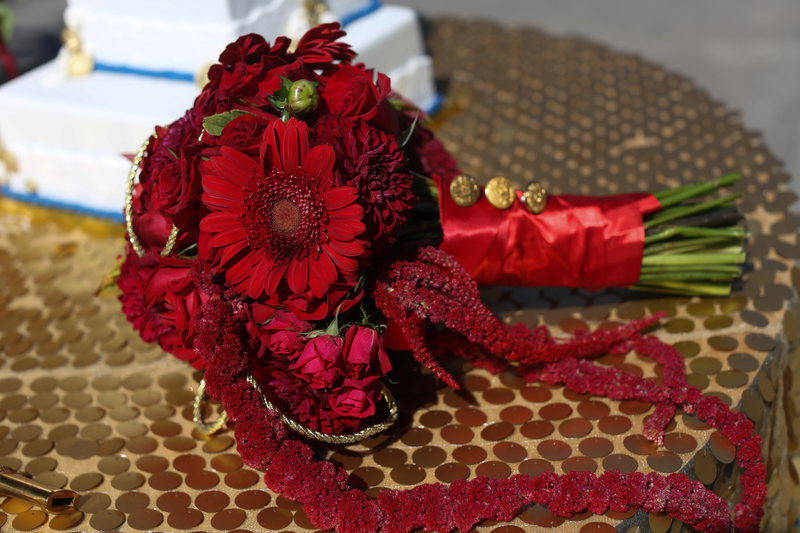 The bridal bouquet and all of the flowers were created by Flower by Coley. 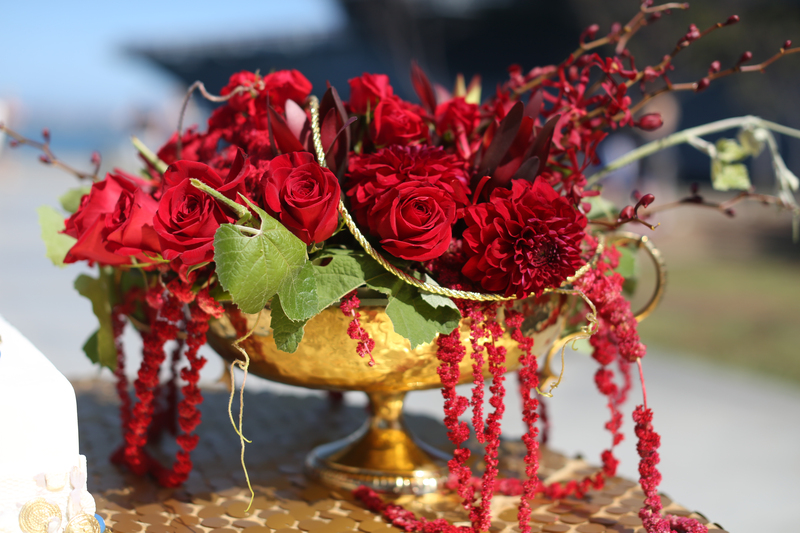 I loved how they incorporated the gold military buttons onto the bouquet. 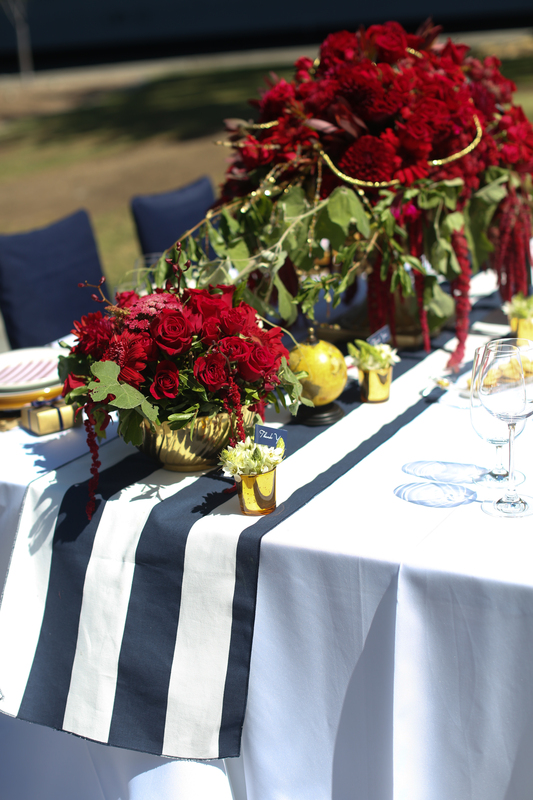 The table was decorated with a crisp white linen topped with a navy and white striped runner. 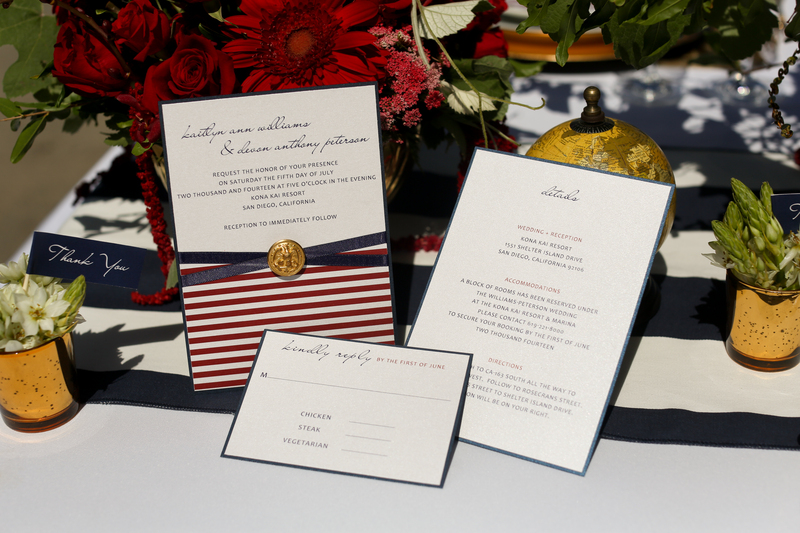 The chairs were covered with linens created by Thimbleana as a playful salute to the military uniforms. 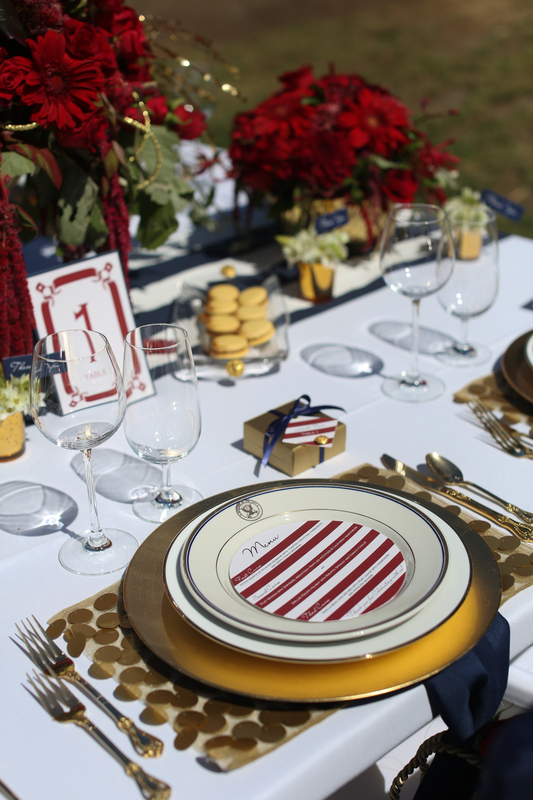 Each place setting wore a gold sequined placemat, a gold charger plate, a dinner plate from a private US Navy collection and a navy blue napkin tied with a gold tassel and red rose. 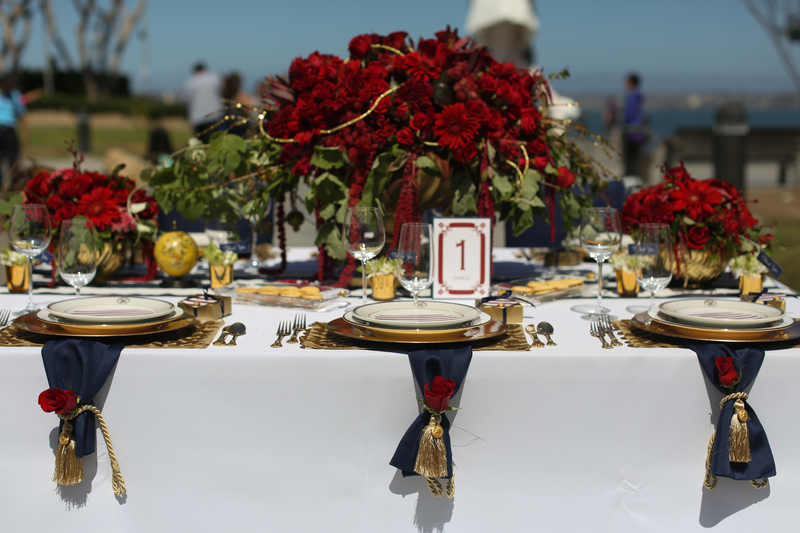 The table numbers, menus, favor boxes and invitations were all created by Take Note! Creations. 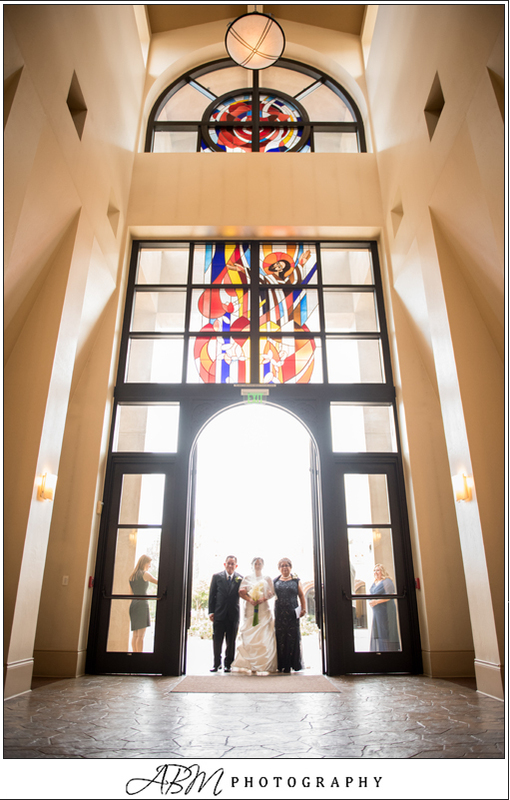 Melissa McClure did an amazing job capturing these gorgeous photos! 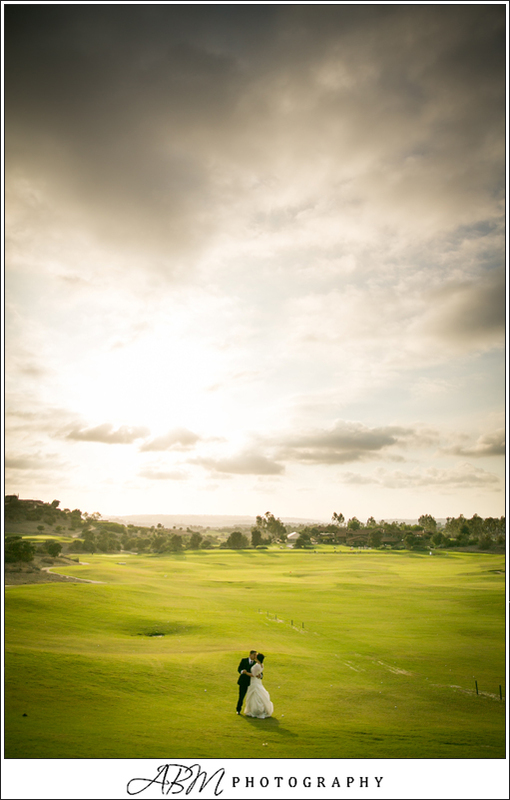 You can see more photos of this San Diego Military Wedding Photo Shoot in the new 2014/2015 edition of San Diego Style Weddings Magazine. 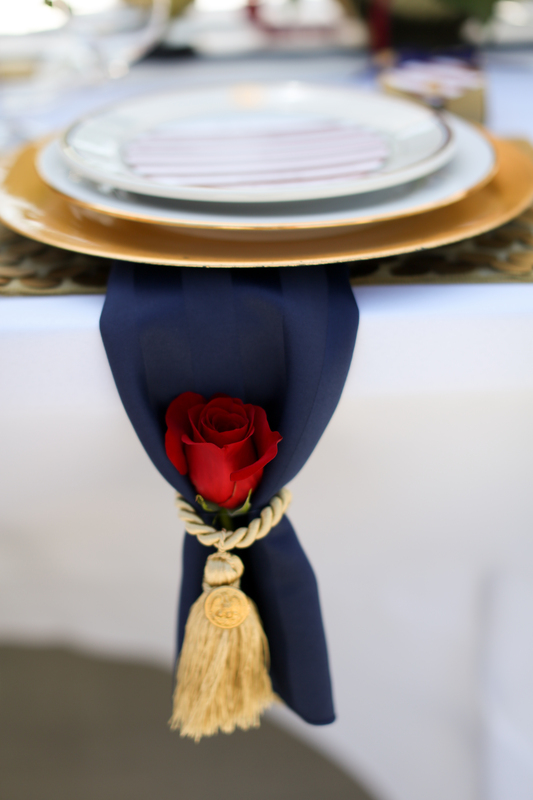 Planning a military wedding? 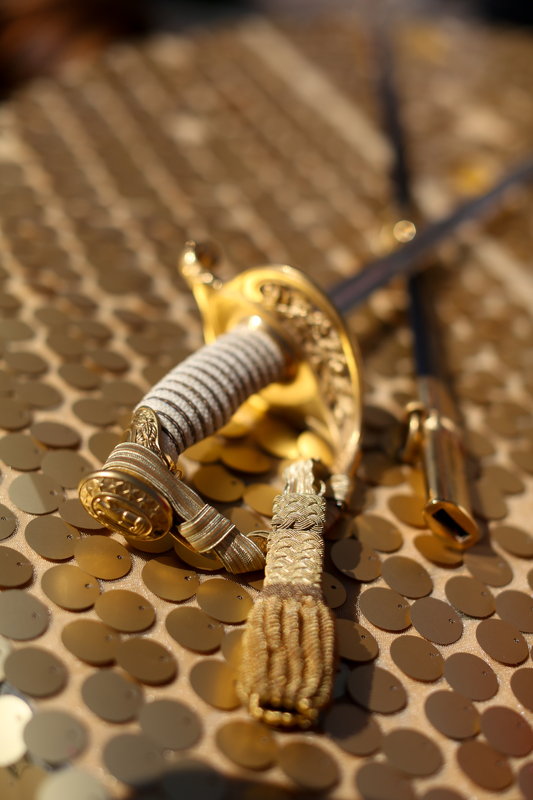 We are a military family and always honor our military with 20% off any wedding planning package. 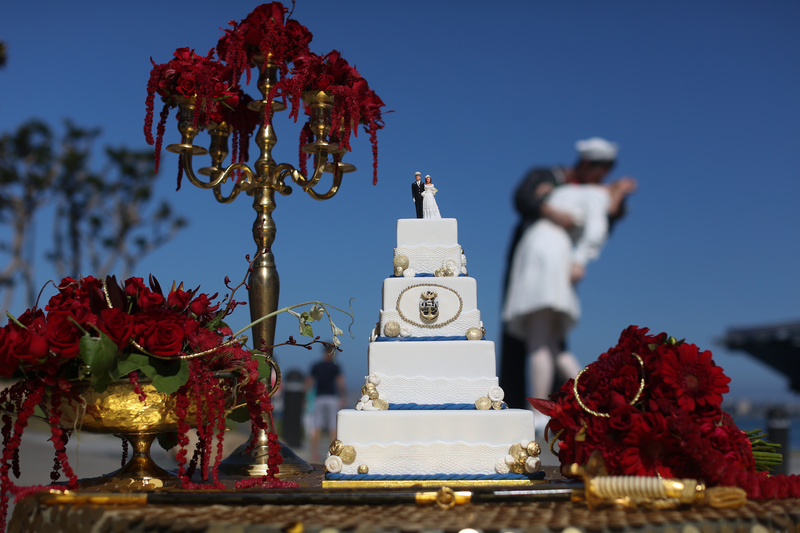 Complete the form below for tips on planning your military wedding! I'm planning a military wedding!